Last month, we told you about the SM-G600, which is supposedly the Samsung Galaxy O7. There has been talk that this phone is a VR-centric device that is the result of a partnership between Samsung and Oculus. The latter is holding its Connect2 event starting on Wednesday, September 23rd, and there is speculation that the new Galaxy O line will be introduced at that time. Besides the Galaxy O7, there is also reportedly a device with the model number SM-G550 called the Samsung Galaxy O5. A handset sporting that model number happened to make it through the GFXBench benchmark test, revealing entry-level specs. We're talking about a device with a 5-inch screen, carrying a 720 x 1280 resolution. The Exynos 3475 SoC is under the hood, featuring a quad-core 1.3GHz CPU, and the Mali-T720 GPU. 1GB of RAM is inside, along with 8GB of internal storage (4.5GB available to the user). The camera combo on the phone appears to be (back to front) 8MP/5MP, and the phone will not come with NFC. It will come, however, with Android 5.1.1 out of the box. 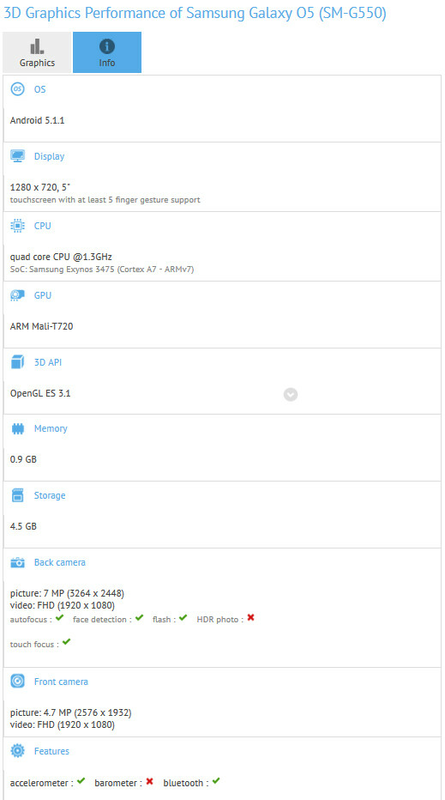 The Samsung Galaxy O7 was benchmarked by AnTuTu last month, revealing that a Snapdragon 410 is under the hood. That means there is a quad-core CPU and the Adreno 306 GPU inside the device, along with 1GB of RAM and 8GB of native storage. A 13MP camera adorns the back, and a 5MP snapper graces the front of the unit. Android 5.1.1 is installed. If the Galaxy O line has something to do with Oculus, we should know before this week is out. Stay tuned! Why would you buy this when you can get a S4 around the same price (im guessing). Then just root it with a S6 Rom. When I saw entry level i automatically assumed it was another core, prime, duos, ace, grand or whatever they want to call it phones. This is BS, there will not be a Oculus Rift phone from Samsung! Why the low specs? 1 gig ram and 8 gig storage. Must be wrong info. This is pathetic. Android running 1gb Ram and entry level CPU. This phone will laaaaaag. I don't want to hear entry-level as an excuse when I can likely purchase a phone from a Chinese vendor with mid-range specs at a similar price point. Some of which, actually work on US LTE bands. And yes, 1GB of RAM can be handled...on Kit Kat. Even 5.1.1 is still featuring memory leak issues and people with Moto G's, a pretty much stock build device, are still experiencing lag, redraws, and app closure. Lets team that 1GB of RAM up with TouchWiz and a baby Exynos and see how that works out. My neighbor bought the Core Prime which runs a 410 with a smaller snapper and low res screen. It was so bad that it barely lasted a week before he needed to return it. I told him that he was better off with a Windows Phone in terms of his budget to performance. I can only hope that Marshmallow will fix the variety of problems associated with Lollipop. 1. For an average consumer to go through the bands of a chinese device to see if it would drain the battery or not is not easiest thing. 2. And what will you do when you chinese phone is damaged or you require a customer service ? Samsung penetration and service amongst the best. 3. What let you to believe its a 'baby exynos' even before its unveiled ? 4. I've used Moto G for nearly a year which originally came with originally which I upgraded to Lollipop and I've experienced no lag at all. Even if it were true, why should samsung get the blame if Google F*ked up an update ? All that aside, people need to realize what function a entry level phone serves. Its not meant to be hogged with games. You fail to realize that there is a section of society who cannot afford expensive phone. Some people buy these entry level phones for just whatsapp & Google Maps and sometimes Facebook and thats about it. If you dont want to hear entry-level phones, good for you but not many people have luxury to pay even $100 for a phone. Or got time and money go through the list to see which Chinese vendor phone would run LTE. PS. For entry level I'd recommend WP too but that wasnt my original post about. VR needs power and resolution, and this has neither. How do they expect this thing to run at all with the heavy bloat touchWiz brings. Even stock Android would have trouble with those specs. Not to mention unless the VR headset has its own high res display, 720p is horrible for VR as each eye sees half the number of pixels. You'll see massive squares and nothing else. For gods sake samsung, bring out a 6.3'' note with physical camera button.